This selection of films from Sundance Film Festivals past are by the world’s most creative animators, with styles ranging from handmade drawing and painting to puppetry, with stories of love, art, bubbles, nudism, the creation of the universe and what it all means to you. Written and directed by Julia Pott. United Kingdom, 7 minutes. Written and directed by Don Hertzfeldt. USA, 23 minutes. Written and directed by Mikey Please. USA/United Kingdom, 6 minutes. Written and directed by Stephen Irwin. United Kingdom, 12 minutes. Written and directed by Marc James Roels and Emma De Swaef. Belgium/France/Netherlands, 17 minutes. Written and directed by Chris Landreth. Canada, 11 minutes. Chris Landreth, the director of the Academy Award–winning short Ryan, plays Charles, a man paralyzed by his inability to remember a friend’s name. Thus begins a mind-bending romp through a game show of the unconscious—complete with animated celebrity guests. Written and directed by Kelly Sears. USA, 7 minutes. Written and directed by Bernardo Britto. USA, 6 minutes. BELLY: Julia Pott is a British animator and illustrator living in Brooklyn, New York. Her films have played at festivals worldwide including Sundance, SXSW, and Annecy with awards from festivals including AFI FEST, Chicago, San Francisco and Holland. She was named one of the 25 new faces of independent film by Filmmaker Magazine in 2012. IT’S SUCH A BEAUTIFUL DAY: Don Hertzfeldt is an Academy Award–nominated American animator and independent filmmaker. He is the creator of many animated films, including It's Such a Beautiful Day, The Meaning of Life, and Rejected. His films have received more than 200 awards and have been presented around the world. MARILYN MYLLER: Mikey Please is a London-based animation writer and director. His films have won BAFTAs and been short-listed for the Academy Award. Please's thesis film, The Eagleman Stag, premiered at the 2011 Sundance Film Festival and went on to win more than 30 international awards. He has written for Disney and Britain's Film4 and is currently in development on his first animated feature with Warp Films. THE OBVIOUS CHILD: Stephen Irwin is a British animation director and a graduate of Central St. Martins College of Arts and Design. His short film Moxie was awarded the Grand Prize at the Ottawa International Animation Festival in 2011, and The Black Dog's Progress was named the Best Short Film at the 2010 British Animation Awards. He has received commissions from the UK Film Council, the BBC's New Talent program, Animate Projects from the Arts Council England, and Britain's Channel 4. OH WILLY...: Marc James Roels was born in Johannesburg in 1978 and studied animation at the Royal Academy of Fine Arts in Ghent, Belgium. He has directed three live action short films (Mumbler, 2008; A Gentle Creature, 2010) which have each garnered several international awards and nominations, including the Berlin Film Festival and Clermont-Ferrand Short Film Festival. He also directs live-action commercials at CZAR.BE. Oh Willy... is his first animated short. Emma De Swaef was born in 1985 in Ghent, Belgium, and studied documentary filmmaking at the St-Lukas Academy in Brussels. She decided to put her knitting and craft skills to use in her graduate film, Soft Plants. The short introduces the character of chubby office worker Willy. She works as a modelmaker on commercials, most recently designing and animating a little man made out of sugar cubes for a Belgian sugar brand. 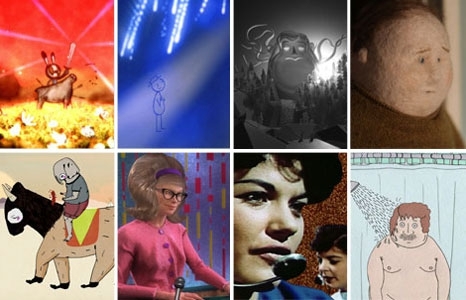 SUBCONSCIOUS PASSWORD: Chris Landreth is one of Canada’s most celebrated animation directors. His first short, The Listener (1991), was followed by the Academy Award–nominated The End (1995) and Bingo (1998), which won a Genie Award for Best Animated Film. In 2004, the National Film Board of Canada released Landreth’s Ryan, which won the 2005 Academy Award for Best Animated Short. The Spine (2009) furthered Landreth’s exploration of the human psyche. Striking a lighter tone than his earlier films, Subconscious Password continues to demonstrate his evolution as an artist. VOICE ON THE LINE: Kelly Sears is an animator and filmmaker living in Los Angeles. She received a B.A. from Hampshire College and an M.F.A. from the University of California, San Diego. Her collage animation media practice draws from genres such as experimental film, documentary, essay films, recycled cinema, and critical fiction. Her work has screened at museums, galleries, and film festivals, such as MOMA, the Hammer Museum, LACMA, the Museum of Fine Arts, Houston, Machine Project, Yerba Buena Center for the Arts, Light Industry, Sundance Film Festival, Ann Arbor Film Festival, and Black Maria Film Festival. YEARBOOK: Born in Rio de Janeiro, Brazil, Bernardo Britto graduated from NYU's Tisch School of the Arts. He codirected the feature film Nothing Yet (2009) and received the National Board of Review animation grant in 2011. In 2012, he was selected as a Marcie Bloom fellow and codirected the feature Wisdom Teeth. In 2013, his film Places Where We Lived screened at such film festivals as SXSW, the Chicago International Film Festival, and the AFI Fest, where it garnered the award for Best Animated Short.